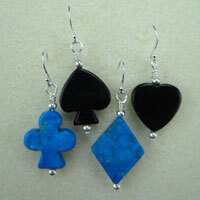 Make your own combination of card pips to wear! Make your own earring set! 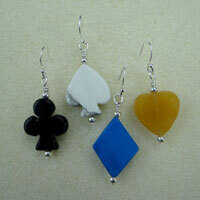 The Card Pips is a set of four different earrings- YOU decide which two you will wear! Maybe you want to wear two of the same color, or maybe two different colors! Perhaps you'll wear the heart with the diamond- or maybe the diamond with the spade! 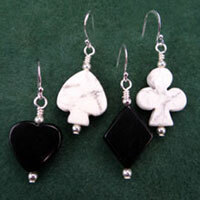 Perfect for magicians, gamblers and card players! And how sweet are these! Each pip is hand carved from real gemstone material. 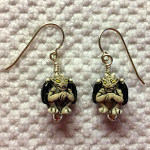 To protect your ears, the ear wires are, of course, sterling silver! Each set of earrings is individually handcrafted by jewelry artist Jackie Monticup of White Rabbit Jewelry here in Virginia, and is her original creation. And she only made a few! When we sell out, they're GONE! The BLACK stones are jet obsidian. 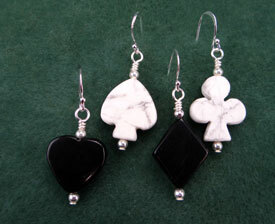 The WHITE stones are white howlite. The BLUE stones are blue howlite. 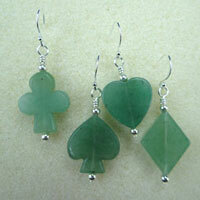 The GREEN stones are cloud jade. The BROWN stones are toffee quartz. Yes, the white gift box IS INCLUDED!